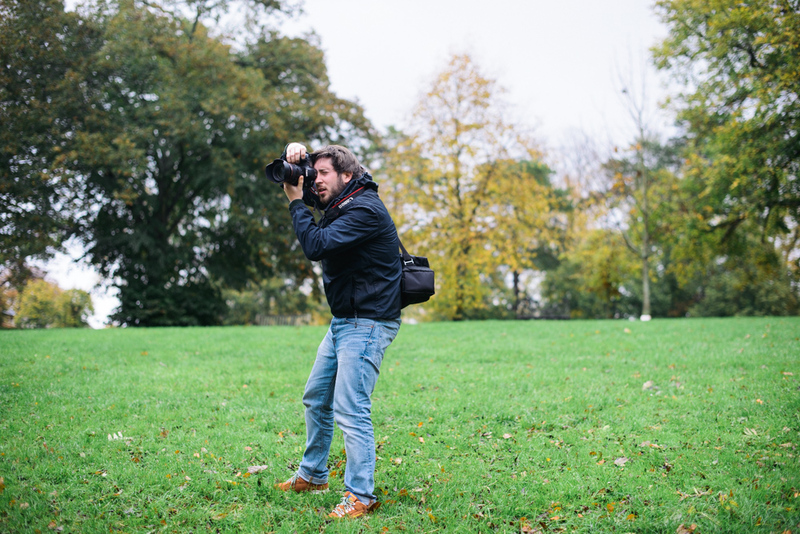 Could you tell us your name and maybe where the photograph is taken? 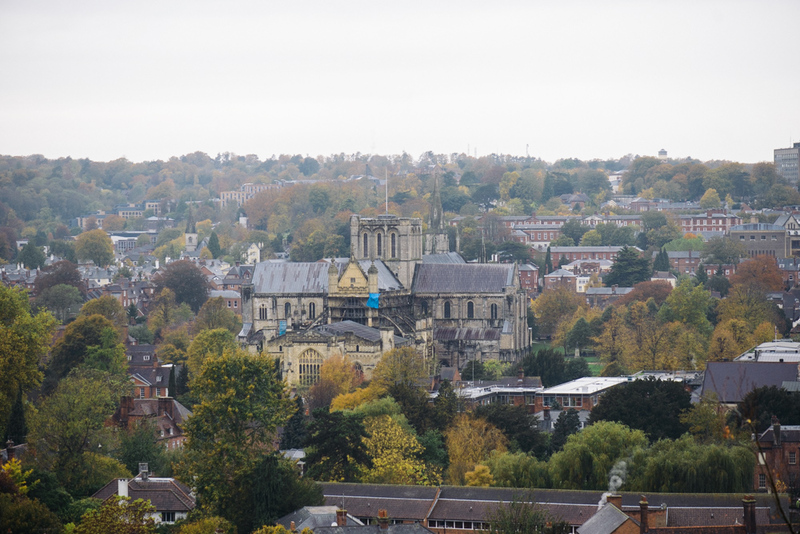 My name is Anne Bray and the photo was taken in Winchester on St. Giles Hill, overlooking the city. Can you talk us through the day that the photo was taken? I don't really have a clear memory of when it was taken actually, although I associate it with the time when Peter and I were engaged. We got engaged on the 2nd October 1981 and then a few weeks later, when we'd got the ring and we wanted to share our news and celebrate, we had a party at home and I think it might have been the next day or the following weekend, we went out with a friend up on to the hill and that picture was taken. It wasn't "Let's go and take some engagement photos", it was, "We're out, this is a nice place, let's take a picture." It must be a picture that at some point I chose and put up in a frame, so I've remembered it, gone back to it and looked it at. It's a place I've revisited as well, pictures help you to make memories don't they. Was that place particularly special or did it have any significance at all for you? Well again here the memories aren't ever so clear, but Peter and I were introduced in February 1981. We were part of the same church, which mean't that we came together to do certain things, so in May that year, we were going together, well, not together, we were both going on an event which was called the ‘May Morning Walk’. This is where we met at a certain place in Winchester at 7 o'clock in the morning on the Sunday and went for a walk and had breakfast and a short act of worship. I've never been very good at getting up in the mornings, but I used this as a reason to ask Peter to come and pick me up, knock on my door, to make sure I was up and didn't miss it! So that's what he did, and I think that same morning, we carried on and went did a longer walk and I guess that was the beginning of our relationship. Then over the next several months we spent a lot of time together, and there were two occasions, of which one I think was on St. Giles Hill, when he said to me, "Can I ask you the question now?" and I said "No, not yet, I'm not ready." We had only known each other a matter of weeks. There was also another time at a place locally in Winchester and then one evening, the 2nd September that year, when we were just in the flat that I lived and shared with a friend, she wasn't around that evening and he asked me then would I marry him and I said yes, without thinking that time, so I guess for him that was the third time of trying. So, St Giles Hill, somewhere in those few months, it had been a placed that we'd been to, a nice little spot to go for a Sunday afternoon walk. Do you go there much now? Is it a place that you return to? Not very often, perhaps because I would prefer to take a more challenging walk, but it still is a special place, especially because Simon, my son, took his girlfriend Sarah there and and asked her to marry him there as well. It sounds like Peter was pretty tenacious! Could you tell me about his person, what he was like? ...I just knew I liked him as soon as I met him. He was gentle and kind, intelligent and practical. He always did a good job. He was forgiving. There were people that he would say odd things about, to judge them, but I think far less than I did, and he would be a friend to anybody and support them, he did that particularly in his work. His main love was to be outside, in the garden or farming, enjoying the fresh air, growing things. Time with family, being a great dad and a great husband…and we miss him so much. You talk with friends and other widows about what you miss and what you have to take on, and how hard it is, but you don't often talk about the person and what they did, because it's hard I suppose, and because nobody else knows quite like you did. To keep going, you building a new identity, with life on your own. You do things differently, because things aren't the same as they were and never will be and in accepting that, you do things differently, rather than, sort of, stand still, and that's something you can do in time. An image which I use is expanding your world. Your loss doesn't diminish, you just put it into a bigger space, and then it's not so overwhelming. What was it like when we asked you to find a photograph? Did you know which one to choose immediately? Once I thought of that photo, I thought, yes, that's a place that I'd like to go back to. I suppose especially because it was a moment of just Peter and me. There were other times I could think of, times we spent on the coast or other places. I don't know who took that photo actually, I'm not certain, but I sort of just think of it as the two of us, I don't imagine anybody else there, where as when you go out as a family, you get photographs of others. There aren't that many photos that I've got which are just the two of us, and it is such a lovely place. Looking over the city now, no more than 30 years on from that photo, I can just see so many significant places that were so much part of our lives together, because we stayed in the same place the whole time. What was it like retaking it, with us asking you to go up there and stand there again. I enjoyed it. I have been back there, it wasn't as if I was going back and it was bringing back difficult memories. It was a good thing to do. In the 3, nearly 4 years since Peter died, I've revisited lots of places that we'd been to and you think, well, is it going to be hard or is good to recreate the memories, but if you do feel strong enough to go back to a place that you've been before and remembering good and happy times, it's a positive thing, if you feel you can. I didn't get upset going up there, but if you do, so what! It's all part of the letting go and the healing I think. "In all the mix, your mind, in bereavement, goes over and over all the difficult times. For a long time that happened, but not so much or hardly at all now. Now I find that the things that I do remember are usually because there was a photo to capture that moment." Do you think photographs play a role in memory and remembering? Very much so, I think. One of the things about bereavement was I found some memories I felt had gone and I also felt generally day-to-day that my memory wasn't so clear. In all the mix, your mind, in bereavement, goes over and over all the difficult times. For a long time that happened, but not so much or hardly at all now. Now I find that the things that I do remember are usually because there was a photo to capture that moment. I was looking through some old photos recently, and it's always good to look at them and remember because time is a funny thing. They bring back things from a long time ago, that, you almost think, well was that me then all that time ago? Once you get to my age, you know, life with Peter, before we had family seems such a long time ago and so different, that it is good to have photos to remember that and bring those moments back again. Definitely, I wouldn't be without photos.